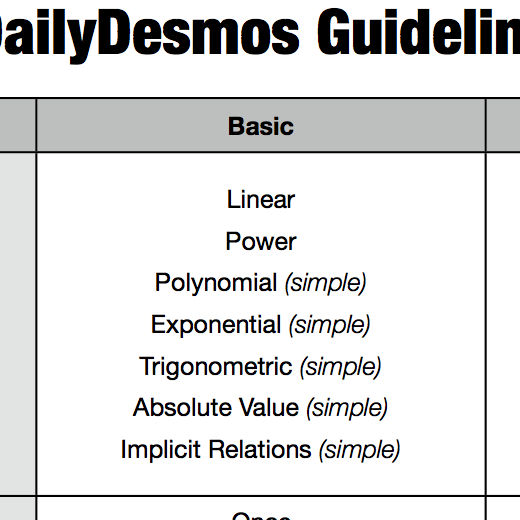 When we launched Daily Desmos a few days ago, we essentially made up the rules as we went. The discussion of what qualifies as Basic or Advanced actually came after our first few challenges. We’ve cobbled together the following guidelines for creating Basic and Advanced challenges to help those who wish to play along (both in solving and creating the challenges). Before reading the guidelines, keep in mind that they are guidelines, not hard and fast rules. Also, to borrow from a comment Justin made in an email, Daily Desmos isn’t about introducing sophisticated, uncommon functions—like the gamma function or the hyperbolic secant—but clever or subtle uses and combinations of elementary functions. With that in mind, here are the guidelines!